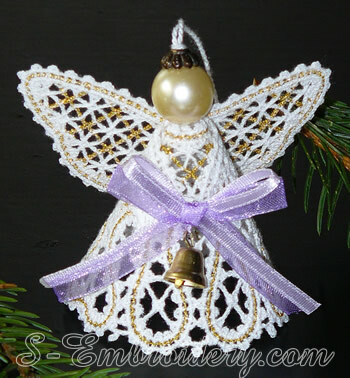 A free standing lace angel machine embroidery design in Battenburg lace technique. 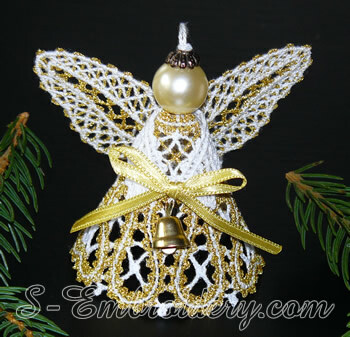 With this lace embroidery you will create a nice 3D angel Christmas ornament. The angel is put together from 2 parts - the body and the wings. The set includes 3 versions of the body, each with different color scheme, as well as 3 versions of the angel wings. Two of the wing versions differ only in the number of colors while the third one is a different design with different lace. 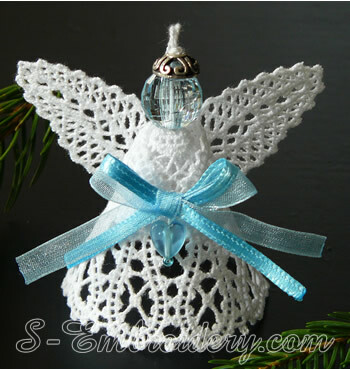 The different versions of the angel body and wings can be used in any combination. All design parts will fit in 4x4 hoops. You receive 6 machine embroidery files in one of the supported formats and 2 PDF files with design information and instructions.